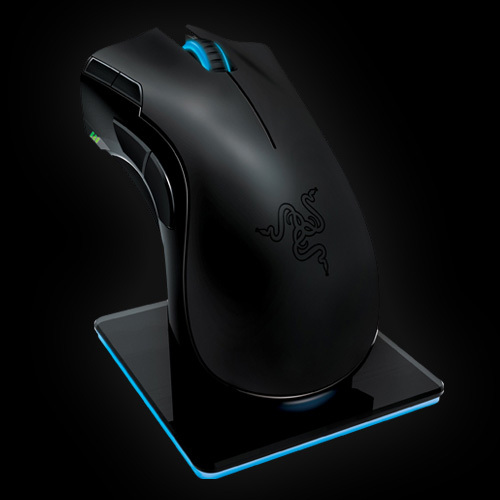 The Razer Mamba looks like a winner for gamers or anyone looking for a high-performance mouse: Lag free, 2.4GHz wireless or wired, with teflon base, and 1ms polling rate, rather than the usual 8ms. Razer has unleashed the full potential of gaming mice by designing an ergonomic, lag free gaming mouse with 2.4GHz gaming grade wireless technology, making it the fastest mouse both on and off the cord. With dual mode wired/wireless functionality, the Razer Mamba lets users immediately and seamlessly switch from wired to wireless play. With first in class polling rates at 1ms as compared to traditional wireless mice that poll at 8ms, players will have virtually lag free game play. The Razer Mamba also includes a host of features like Razer Synapse™ on-board memory that lets gamers store and bring their mouse settings wherever they go. And the world's fastest 5600DPI Razer Precision™ 3.5G Laser sensor, the Razer Mamba wireless gaming mouse lets gamers move with lightning speed and precision to easily escape from becoming prey.